They say the journey is the destination, and nowhere have I found that to be truer than on the Road to Hana. It’s a must-do for any visit to Maui. It’s short in distance—only 42 miles—but it tests you in ways that perhaps no other stretch of American road does. The drive is a doozy one. 600+ hairpin curves and 59 bridges, more than half of which are only wide enough for one car, is enough to test the patients of the saintliest of drivers. But the rewards are plentiful. Around each curve, a new jaw-dropping view. From black-sand beaches to roadside waterfalls, the journey to Hana is a picturesque one to say the least. It’s not for the faint of heart, but should you choose to embark upon it, you’re in for an extraordinary adventure! Before hitting the road, download the Maui Road to Hana GPS Guide on iTunes. As you drive, it will alert you to upcoming scenic vistas, secret swimming holes, and lots of fascinating facts and history. Make sure you get a full tank of gas before beginning you journey. Get an early start—no later than 7 a.m.! Paia is the place to go to grab a quick breakfast and your picnic lunch. Call ahead to Anthony’s Coffee Co., and pick up your healthy, fresh lunch, with a $10 refundable cooler rental. It doesn’t take long to get to your first suggested stop. At Mile Marker #2, you’ll find Twin Falls, a family-owned bio-diverse farm. A short, easy walk from the parking lot will get you to Lower Falls, or a one-mile hike on a slippery, but beautiful trail will get you views of the Upper Falls. Take your first dip of the day! Make sure to grab some fresh-squeezed sugarcane juice or coconut candy before getting back on the road. 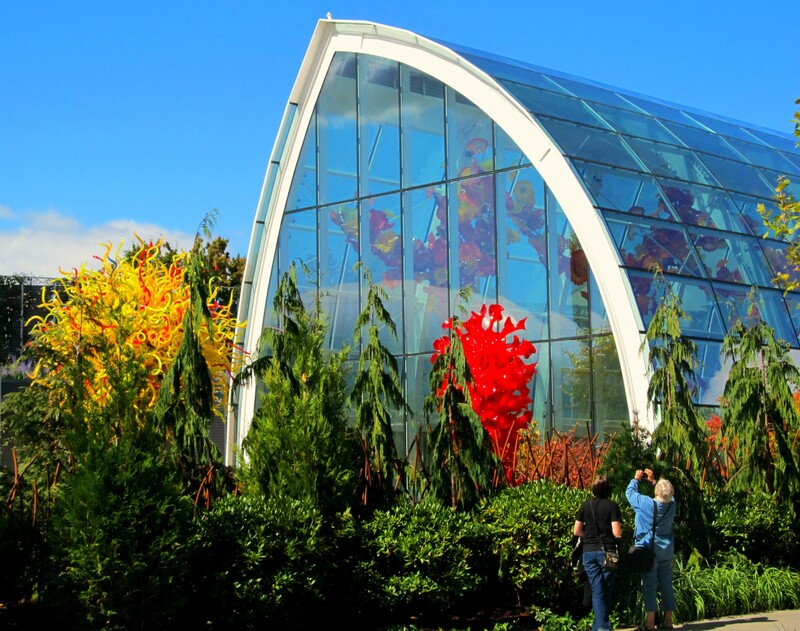 A bit past Mile Market #10, stop at the Garden of Eden and Botanical Arboretum for scenes straight out of Jurassic Park—no, really! The 26 acres of trails of tropical rain forests filled with unique Hawaiian flowers were featured in the opening scene of the movie. Waianapanapa State Park at Mile Marker #32 is the perfect place to set up that picnic lunch. With black-sand beaches, lava tubes, rock arches, and churning waves, this is classic East Maui scenery you’ll want to take some time to appreciate. Soon, you’ll arrive in Hana, a sleepy village with less than 1,000 permanent residents. 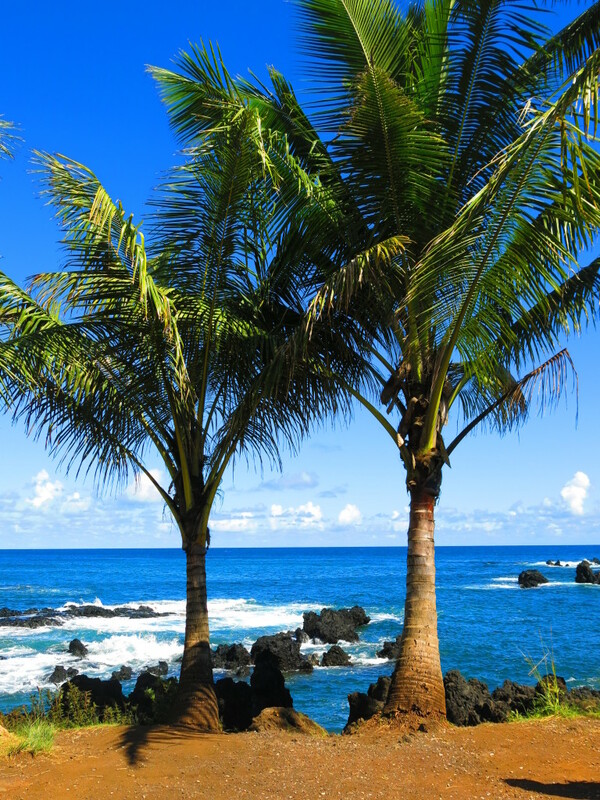 There’s not much there, but after making the journey, you’ll want to get out at Hana Bay Beach Park. Go for a quick swim and enjoy the large, black-sand beach before continuing on past Hana. 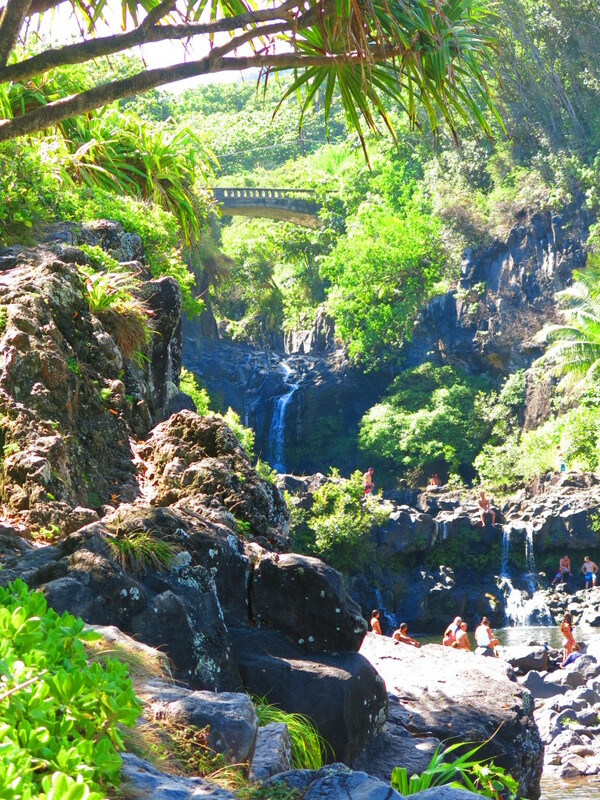 You’ll want to venture just a bit farther to Mile Marker #42: ‘Ohe’o Gulch, also known as the Seven Sacred Pools. Part of Haleakala National Park, this is one of the best stops along the Road to Hana—even considered a must-see by locals! Freshwater pools cascade down into the ocean, creating perfect natural swimming pools. Ask about weather conditions before taking the short walk from the parking lot. This is a prime place for flash flooding, and you don’t want to be caught there when that happens! After soaking in the pools, it’s time to do an about-face, and venture back to Western Maui. 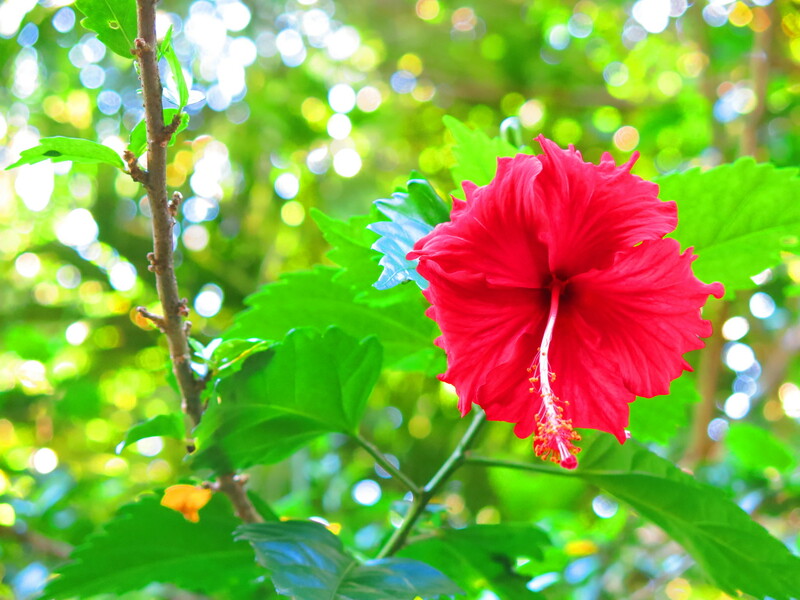 You can decide to make the trip over two days and spend the night near Hana. Travaasa Hana is a remote, incredibly luxurious place to say, and was voted the No. 1 resort in Hawaii by Condé Nast Traveler’s in 2011. 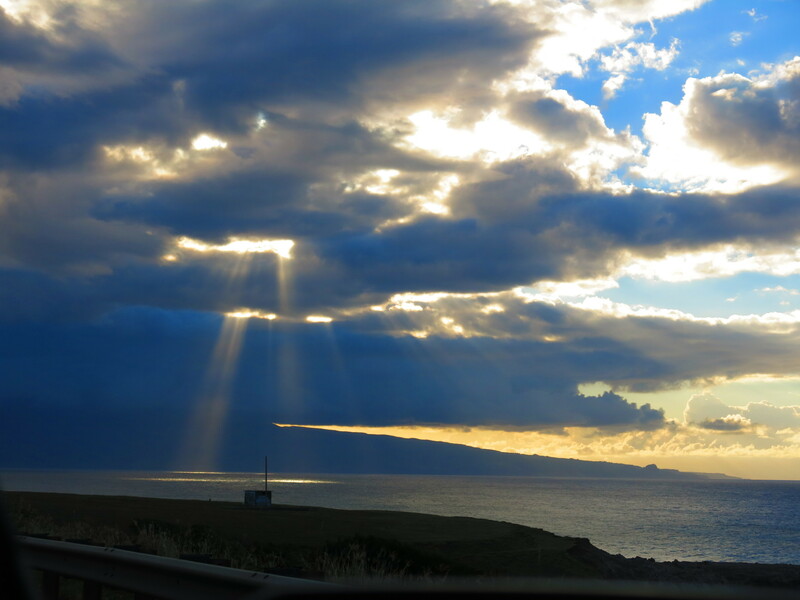 If you choose to make the full trek in one day, aim to get back to Paia and Kahului around sunset. Do you have any other favorite stops along the Road to Hana? 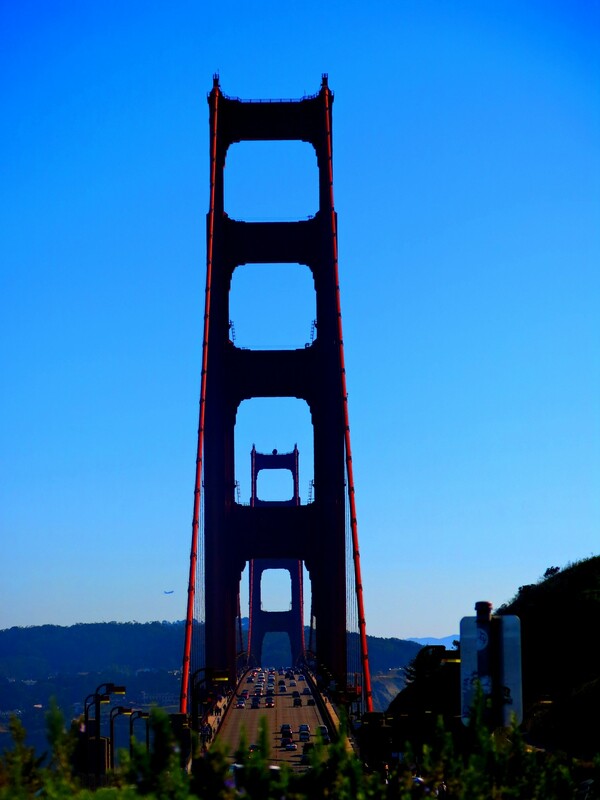 Feeling patriotic in San Francisco. 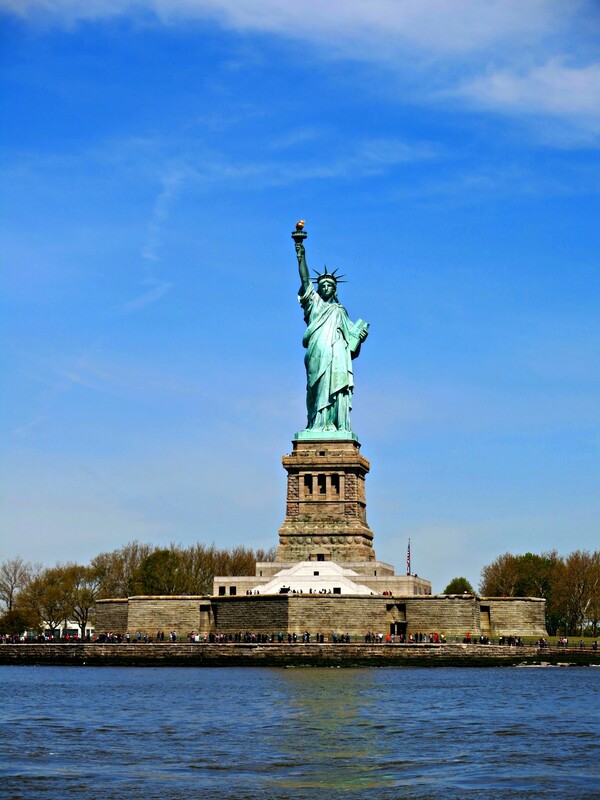 In honor of the Fourth of July, this week’s #FriFotos theme is America. Here are a few of my favorite patriotic symbols I’ve found in the Land of the Free. 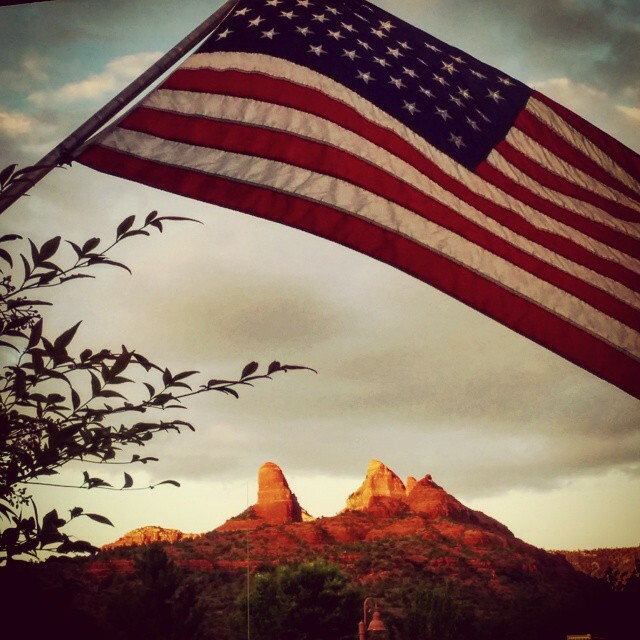 The flag flies over Sedona’s red rocks. 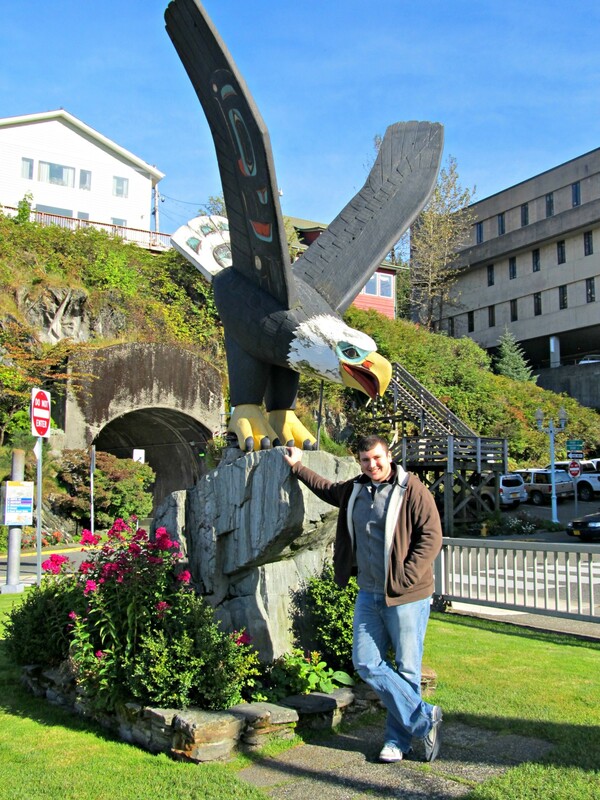 Kyle poses with an eagle totem in Ketchikan, Alaska. 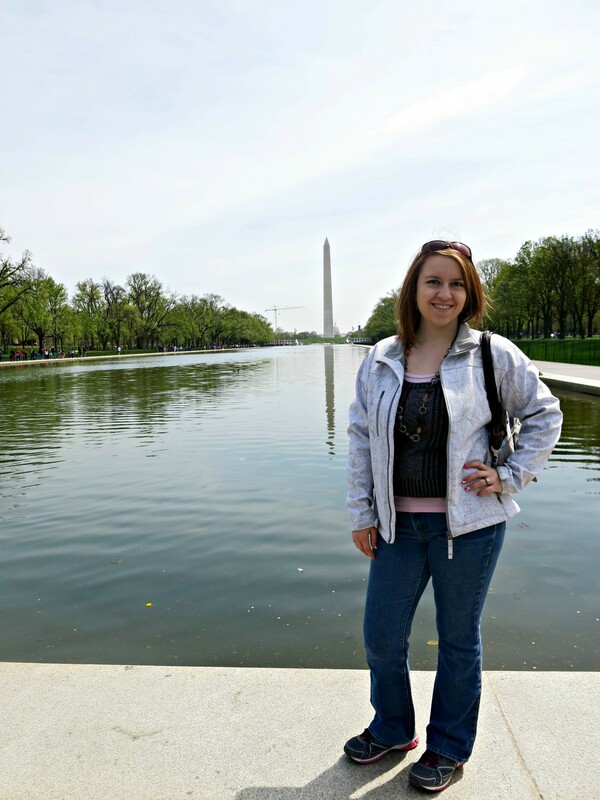 Me and the Washington Monument in DC. "Dancing" with Maui at Sea Life Park. In August of last year, Kyle and I visited Hawaii, and there was one thing I wanted to do above all else: Swim with a dolphin. Mind you, for someone who enjoys the water, I’m absolutely petrified of swimming in the ocean. For some sadistic reason, Kyle and I always hum the theme song to Jaws whenever we find ourselves splashing around in the waves. It doesn’t help things. Not to mention the fact that last summer, Hawaii was shark attack capital of the world! We did a kayaking/“snorkeling” adventure one day, and I asked our guide where the young girl had been killed the week before. He pointed. “That beach over there! The shark’s probably not around anymore. Look, there’s a sea turtle! Want to jump in! ?” No thanks. All this to say, swimming with a dolphin in the ocean just wasn’t on the docket for me. Kyle had always told me about this quasi-aquarium his parents had taken him to when he was little called Sea Life Park. They offered all kinds of experiences that would allow me to interact with Flipper! It was the day before my birthday, so Kyle bought me my “dolphin encounter,” which essentially had me standing in a line in a shallow pool waiting for my new dolphin friend, 23-year-old Maui, to come “dance” with me, and even give me a kiss! I know, right!? Sounded pretty cool to me. I was going to get to play with a dolphin. Awesome! Dolphin Maui gives me a kiss at Oahu’s Sea Life Park. Fast forward to last month. Kyle and I went to Cancun, Mexico, for the Travel Bloggers Exchange (TBEX) conference. I attended for work, and Kyle to represent this little blog of ours. 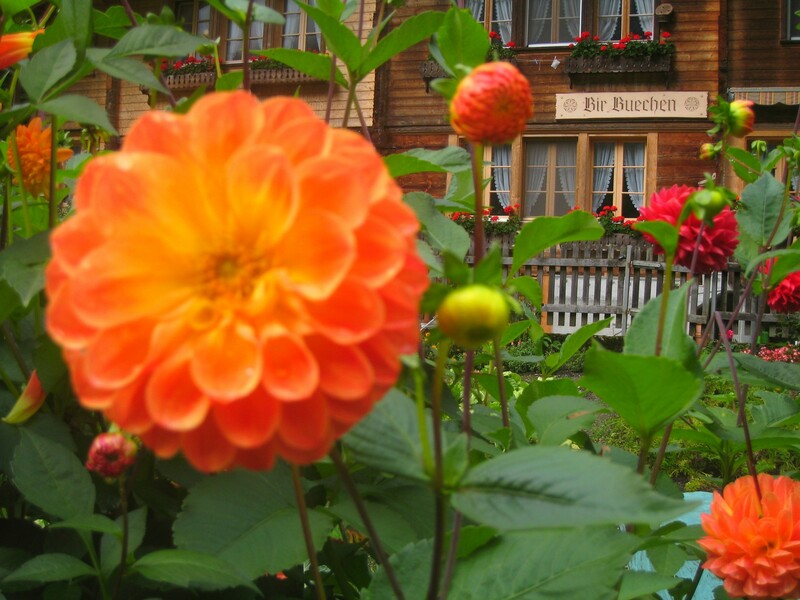 I had been following all the social media activity leading up to the conference, as I always do, but this year, there was a particular brewhaha over one of the pre-conference activities in which bloggers are able to participate. One of the sea life attractions was offering bloggers the opportunity to swim with dolphins. This led to a call for people to boycott the conference. TBEX ultimately dropped the dolphin trip from the list of activities offered, and followed it up with a keynote on the first day of the conference given by representatives from the Center for Responsible Travel, and Green Global Travel. You can check out the controversy, reasoning, and solution here. Now, I am not here to make a big statement about ethical travel. At this point, Kyle and I are writing a fun blog to share our travel experiences with you. I consider myself a pretty savvy traveler, moderately aware of some of the ethical dilemmas in the tourism industry today – probably more so than most tourists, simply because I’ve worked in tourism, and I read lots of travel blogs. I am as concerned with animal rights as the next person—I’ve seen Blackfish—of course I don’t want these beautiful creatures endangered just for my brief amusement. When I first saw a video of an elephant “painting” by holding a paintbrush in his trunk, my first thought was, “Wow, that’s amazing!” The thought briefly crossed my mind: “How in the world could someone teach an elephant to paint like that?” I stopped myself from going there. Sometimes ignorance is bliss. Of course, then I read a really great post by one of my favorite travel bloggers, Matt Long with Landlopers, and quickly changed my opinion on that matter. I know when Kyle and I find our way to Thailand, I won’t be seeking out places we can watch elephants paint, but rather opportunities to volunteer at an elephant sanctuary. But after all this, I feel slightly strange saying I’m not affected in the same way by the plight of my favorite marine friends. 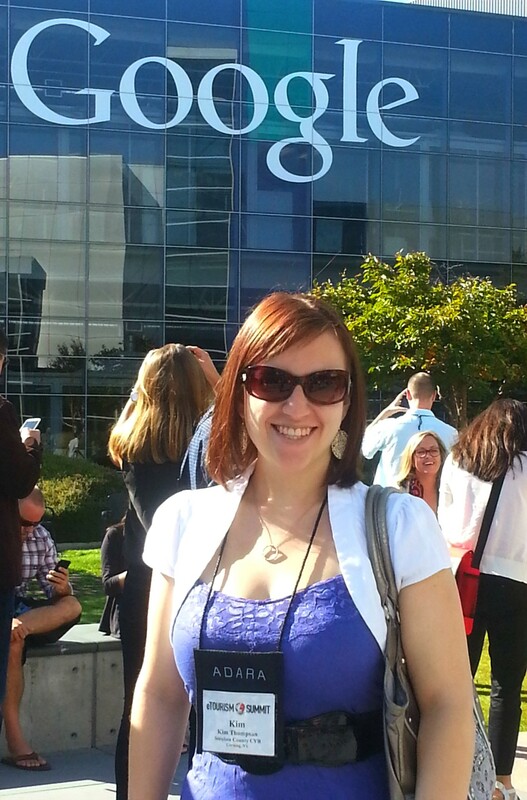 The whole time I was listening to the TBEX keynote, I felt like I was about three inches tall. I wanted to hide under my seat until it was over. The general sentiment was that as bloggers, we have a responsibility to help educate other travelers about ethical tourism—we need to lead by example. We are supposed to be authorities on travel, helping others to plan trips. It’s our responsibility to steer them away from experiences that are harmful to the environment and/or the creatures that inhabit it. All I kept thinking about was my dolphin friend Maui. He seemed so playful and happy to swim up to me and give me a kiss. Was I naïve for believing he actually wanted to do that? Was I in some way hurting him by giving my money to a facility that held him in captivity? I started to hate myself for thinking if I had the experience to do over, I wouldn’t change a thing. If anything, I’d opt for the more expensive, more “interactive” dolphin swim experience. “Dancing” with Maui at Sea Life Park. Dolphin show at Sea Life Park. Getting ready for the dolphin experience at Sea Life Park. I’m not here to lecture you on the ethics of visiting a dolphinarium. I’ll leave that to the experts. I believe it’s good to be informed—as with anything else. Here are some facts. Now you can decide for yourself. As for me, there’s a pretty high probability I’m going to make new dolphin friends in the future. I hate that saying, “If you can’t beat ’em, join ’em,” but it’s true. One of these places isn’t going to close down just because they don’t have my money. There will be plenty more tourists who go, blissfully unaware like I was the first time. Next time, I’ll likely look for a place where the dolphins are kept in a larger, more true-to-nature environment—not unlike the one found at Moon Palace Resort, which hosted TBEX. It’s true that many of the dolphins currently in captivity were actually born in captivity, and would therefore likely not survive in the wild. It makes me sad to think about dolphins who only know the inside of what’s essentially a large swimming pool, but it makes me sadder to think that their lives would be in vain if no one came to visit them. Dolphin shows have always been my favorite part of an aquarium experience, and I don’t see that changing. And I’m not ashamed that I enjoyed my dolphin encounter—or the fact that I’d do it again. 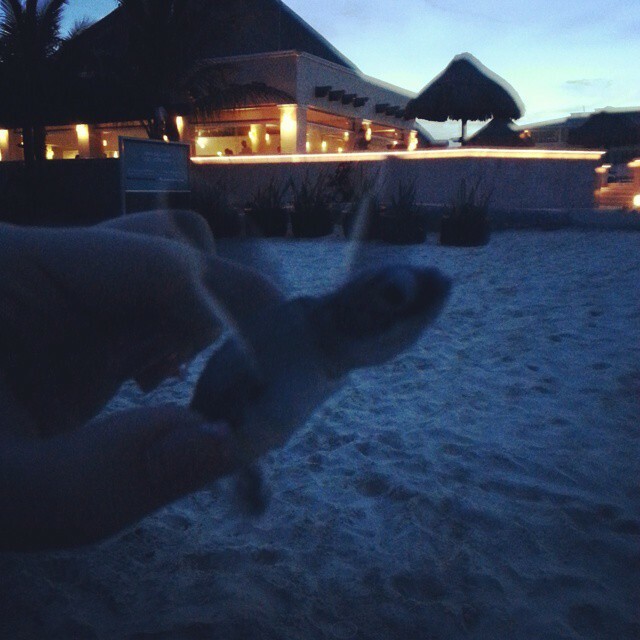 The evening of the TBEX keynote, the resort offered some bloggers the opportunity to participate in a baby sea turtle release. Naturalists had picked up more than 200 turtles less than an hour beforehand, and brought them to the resort to be released. As I was handed my first baby sea turtle, I turned to Kyle and asked, “Do you think this is ethical?” I saw one of the speakers from the morning’s talk in the crowd, sea turtle in hand, so that made me feel better. But I think that’s my takeaway. As long as we ask ourselves the important questions, causing us to seek necessary information and make our own informed decisions, that’s what’s important. That, to me, is responsible tourism. Hey, there! Welcome to Byte-Size Travel. We’re so glad you’ve decided to follow along on our travel adventures! Wondering what the heck we’re all about and why we decided to start a travel blog? Check out our About Us page. This site is a definite work-in-progress, as blog tend to be. We’ve already got lots of great content for you to check out, and we’ll try to add more every week. For now, you’ll find some fun posts about our trips over the last couple of years, as well as a bunch of posts about a study abroad I did in Florence, Italy, back in the fall of 2010. I decided to move them over to our new site because, while I treated them as more of a journal than a travel blog, there’s still lots of great travel stories set in some very cool places! Also check out our Photo Bytes section which we hope will be a fun feature of the site. Over the next few months, we’ll be highlighting the best of our past trips, and sharing stories from our upcoming travels with you. We’ve got quite the travel schedule for this fall and early winter! We’re headed to Disney World and Sanibel Island for our anniversary this week, then Cancun the following week, San Francisco a month later, and Costa Rica for Christmas! 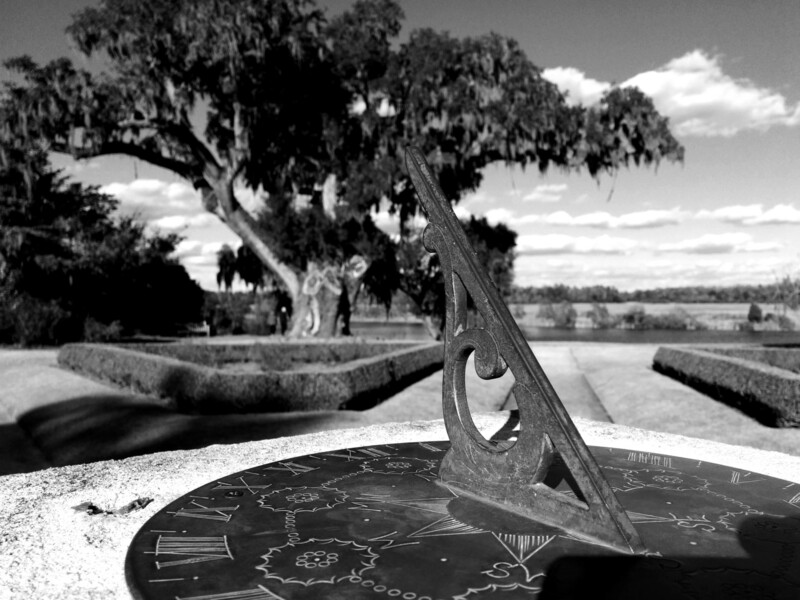 Some is for work, some for pleasure – but we’ll always make time for a little exploring. We are also planning to share quite a bit of information about the beautiful Finger Lakes region of Upstate New York – the place we’re lucky to call home. We’ve both lived here for the vast majority of our lives, and have a great deal of information to share! 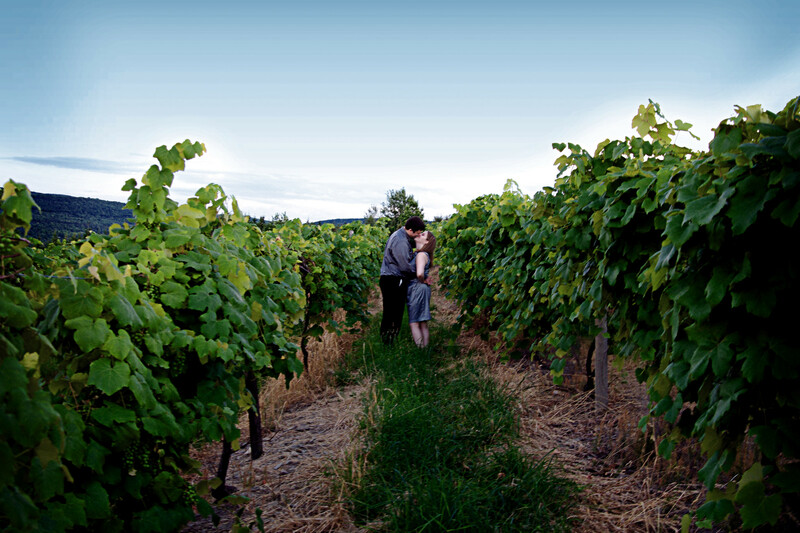 From award-winning wineries (more than 130 of ’em!) to world-class museums, we’ll help you discover why the Finger Lakes should be on your bucket list. Check back often; we’ve got lots of adventures to share with you! Make sure to follow us on Facebook, Twitter, Instagram, and Pinterest! Byodo-In, a beautiful temple nestled in the Valley of the Temples. I was born on the island of Oahu, where I lived for the first 3 years of my life thanks to my father’s stint in the US Marine Corps (thanks dad!). I’ve always had bits and pieces, and general impressions of my time in Hawaii floating around in my memory that’s been augmented by pictures and some home movies. Despite spending only my earliest years in Hawaii, I’ve always identified that more as my home than upstate New York, where I’ve lived most of my life. From a young age, I swore I’d make my way back just as soon as I could – I just never imagined it would take 21 years to make my first trip back. So, when Kim and I decided to make our way there, I was more excited than I have ever been as we boarded that 12-ish hour flight from JFK to HNL, but exactly how much this meant to me didn’t settle in until I saw Oahu come into view. The weather was perfect as we landed and I could see the island that I was born on in all its beauty for the first time in 21 years. I was thrilled. I felt like I was home. Kim and I had only lined up one full day for ourselves on Oahu – we tend to travel fast and try to do as much as we possibly can. In all honesty, I think we were there mostly for me – Kim was more excited at the time for our days on Kauai and Maui. Given this small window of time, we had planned out our day on Oahu in quite a bit of detail. I was insistent that we visited Pearl Harbor, even though I had never visited when I lived in Hawaii because of my interest in World War II history. You can read more about that excursion here. The other big thing on my list may seem strange. I desperately wanted to visit Byodo-In – a Buddhist temple that my mom had taken me to a number of times. We went because it was a beautiful, open space and – well, it was cheap. Basically, it was a nice alternative to the beach (not that you really need one!) for young kids to visit. I had vague memories of a huge bell that I used to ring, the red of the temple and a ton of koi. What I didn’t remember were the mosquitoes. The koi swarm as we feed them. The 9-foot golden Bhudda resting at the heart of the temple. Black swans idle about the temple – they were all asleep during our evening visit! The beautiful Meditation Pavillion rests a little further back than the rest of the temple. Kim rings the sacred bell to clear her mind. Still, Byodo-In is beautiful and a great place to visit that doesn’t get too overwhelmed by tourists. It’s quiet and offers a nice change of pace from the crowded beaches of Waikiki and downtown Honolulu. Byodo-In is nestled back in a cemetery known as Valley of the Temples Memorial Park a few minutes away from Kaneohe (my old home town). It’ll run you $3.00 per adult ($1.00 for kids) to get in to the grounds. After a short, slow drive into the valley, you’ll come to a small parking area. 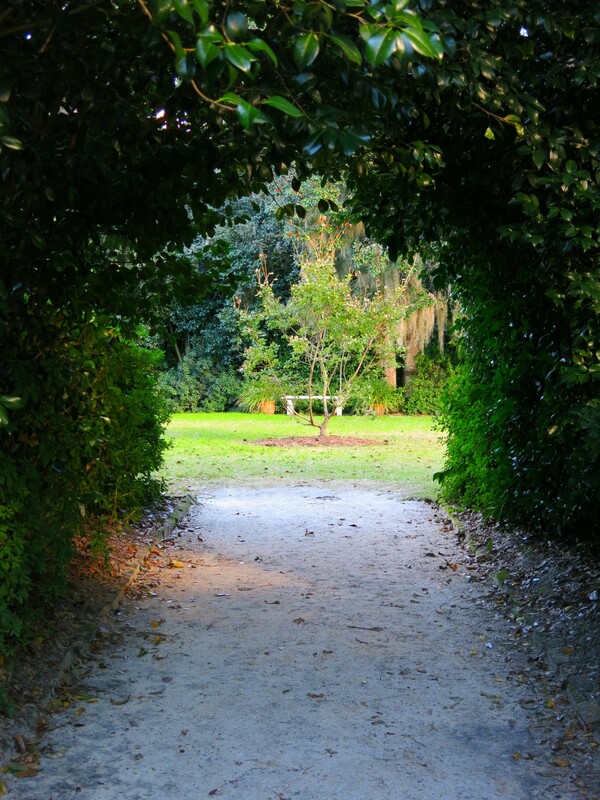 You’ll cross a short bridge and arrive on the main temple grounds. Byodo-In is a smaller replica of a temple of the same name in Uji, Japan, and it is beautiful. Koi ponds surround the temple and they are absolutely jam packed with fish. Black swans, turtles, frogs and peacocks (as well as the aforementioned mosquitoes – bring some good bug spray) can also be found on the grounds. The bell, known as Bon-sho (sacred bell), is near the entrance and is rung to purify the mind and bring you happiness. Be prepared to wait just a few minutes while the small handful of other visiting families ring the bell and get their pictures. Afterwards, you can make your way to the temple or stop by the meditation pavilion. You’ll need to remove your shoes before entering the temple out of respect. Inside stands a 9-foot tall, golden Buddha, which is remarkable to see. After stopping in to see the Buddha, you can make your way to the small gift shop and purchase a pouch of food for the koi. It sounds silly, but you should absolutely do this. There are so many of the fish in the koi ponds that it is really entertaining to watch them swarm over each other trying to fight it out for the food you toss. I stand in front of Byodo-In temple. You don’t need long to visit Byodo-In. It’s a half-hour or hour trip at most, but it can be an interesting and beautiful little side trip. If you are big in to visiting places where TV or movies have been shot, apparently the temple has been worked into episodes of Lost, Magnum P.I. and Hawaii Five-O. Overall, I was surprised at how well I remembered Byodo-In and I’m really glad we visited. 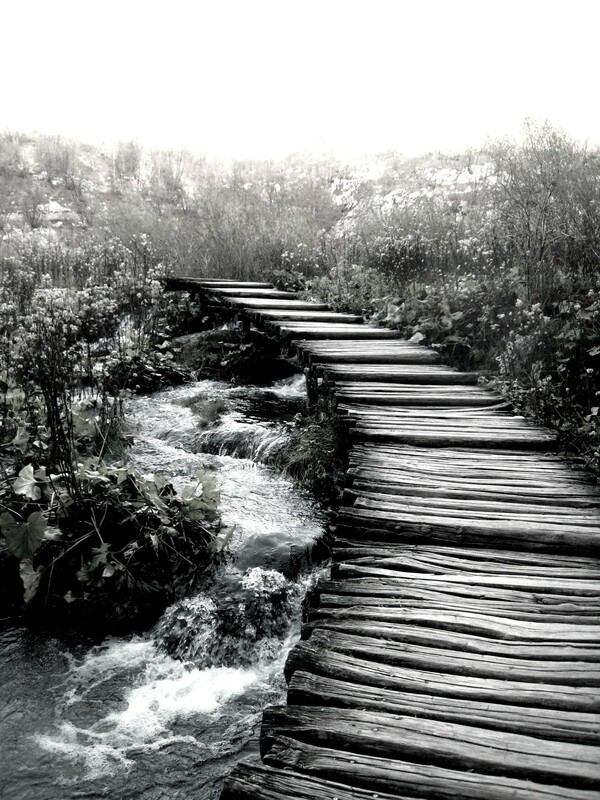 Beyond my personal reasons for wanting to go, we got some nice pictures and experienced something a little different. Also, after spending the rest of the day surrounded by other tourists, it was refreshing to go someplace a little calmer to round out our day. Something you all will learn about me is that beyond travel and video games (and Kim *winks*), I have a passion for history with a particular interest in World War II. I’ve long-since devoured Ambrose’s works (I’m looking at my copy of Citizen Soldiers right now) and made my way through every historical narrative and memoir from the war I can get my hands on. Works by veterans such as E.B. ‘Sledgehammer’ Sledge, Robert ‘Lucky’ Leckie, William ‘Wild Bill’ Guarnere and Edward ‘Babe’ Heffron grace my library as some of my favorite books. I attribute much of this interest and respect for veterans of all wars to my father: a former Marine and a veteran of the Gulf War. It was due to my father’s military career that I have the extreme honor of having been born on and lived for a time on Oahu. In my youth, my parents never took me over to Pearl Harbor, but as an adult, I could not wait to visit the site with an understanding of the event. Let’s get this out of the way really quick in case you missed it in that last sentence (Beware – the rest of this paragraph may sound a bit preachy or self-righteous. I’d call it cautionary, but you may want to skip ahead just a tiny bit if you have young kids and don’t want to be told how to parent by a kid-less punk). War memorials demand a certain amount of respect and are not exactly high on the “thrill factor” – this is by design. People go to these places to garner an understanding of our history and to pay respects to those who fought and died to build that history. I don’t want to dig into the politics of any conflict as that goes well beyond what we want to cover here – what I’m trying to get at is that places like this are a somber, often humbling experience meant to prevent us from forgetting our mistakes so that we don’t end up repeating them. Which brings me to this: war memorials are not really a good family oriented outing with respect to young kids. Those of you with kids know your kids much better than I do (I’d hope) so use your best judgement when visiting lest you get scowled at by the likes of me. That being said, Pearl Harbor is a fantastic place to visit for those looking to gain a bit of perspective on the leading pretense for the United States finally joining WWII. Kim and I visited as part of a whirlwind, daylong tour of Oahu. We had booked a tour with Pearl Harbor Tours. As we were trying to cram a lot of our own activities into one day, we were looking for a short tour and their Pearl Harbor & Historic Honolulu City Tour fit the bill perfectly. They picked us up right from our hotel bright and early in a small tour bus in downtown Honolulu, got us into Pearl Harbor right when it opened and had us back in about 5 hours – we were back by lunch. Our driver was great (his name escapes me) and extremely informative. The oh-so-gorgeous Tripler Army Medical Center. When you arrive at Pearl Harbor, the obvious main attraction and focal point for your view is the memorial platform erected over the U.S.S Arizona. This beautiful monument serves to remind you of the lives lost on December 7, 1941. It was recommended to us that we take the early tour so that we could get a good time for the boat that will take you out to this platform. Apparently, on busy days you can miss out if you don’t get there soon enough. We still had almost two hours to wait and we got their right when it opened. 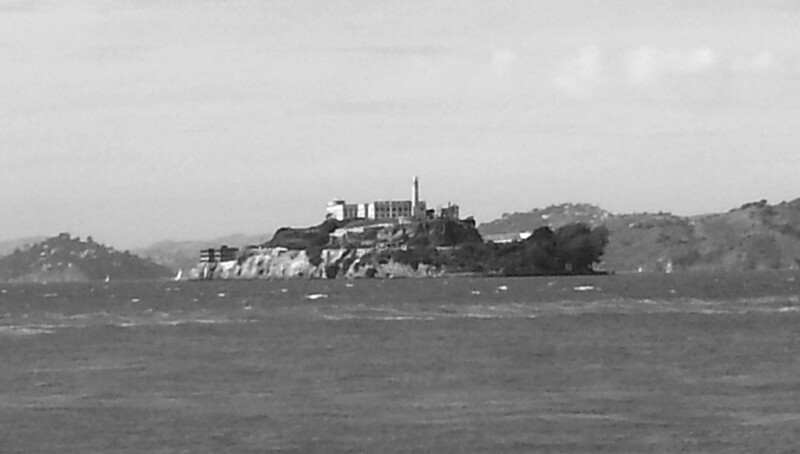 That said, there’s a few nice attractions to take in while you wait for your boat. First, there’s the view of the harbor, (as stated – beautiful). The U.S.S Arizona Memorial with the U.S.S Missouri nearby. Me standing by one of the many quotes from survivors about the grounds. The U.S.S Arizona memorial is in the background. A rainbow appeared over the harbor during our visit. The grounds of the memorial welcome area are well groomed and feature a number of informational plaques and pictures showing how the ships were arranged on that historic day. Quotes from survivors of the attack are engraved on some of the displays, lending some humanity and insight into an event most of us cannot begin to comprehend for ourselves. Additionally, a handful of very detailed and extremely well done exhibits are inside some of the buildings. Highlights include the extended video briefing on Pearl Harbor (you will receive a short version just before boarding the boat to the U.S.S Arizona), newspapers showing the headlines of the attack and other interesting artifacts from the attack. We found that the two exhibits, “Road to War” and “Attack”, while compact, took up a good chunk of the time we had prior to boarding our craft out to the U.S.S Arizona. It is heartbreaking, but hauntingly beautiful. The real highlight though is actually reaching the U.S.S Arizona memorial. As you approach, you get a better view of the U.S.S Missouri (the site of surrender of the Empire of Japan – where WWII effectively ended). This ship stands as a reminder that the tragedy surrounding you was not allowed to fade into antiquity and those that fought to defend the harbor were not lost in vain. Surrounding the Arizona memorial are markers indicating where other American ships were damaged or sunk. The US flag flies above the memorial, fluttering gently in the trade winds. Inside, an air of reverence takes hold of you and your boat mates. At the back is a list of the US Navy and US Marine Corps crew who died aboard the U.S.S Arizona. Small barricades politely remind visitors to stay back and reflect so that everyone can get a good view of this wall of 1177 names. In the center of the platform, a Navy Officer will perform a changing of the colors. The center of the platform has some large viewing cutouts so that you can see the ship below you. Fish glide gently about it and you can still see some slicks of oil and rust floating away in the waves. Some of the taller portions of the ship still poke up from beneath the waves. It is heartbreaking, but hauntingly beautiful. The U.S.S Missouri floats nearby the Arizona. Markers commemorate the spots where the U.S.S West Virginia sank and the U.S.S Tennessee was damaged. The US Flag flies above the memorial. This wall lists all 1177 soldiers who perished aboard the Arizona, most of whom still rest with the ship. A Naval officer changes the colors. This dedication plaque rests under the flag pole on the memorial. A portion of the U.S.S Arizona that rises above the waves. 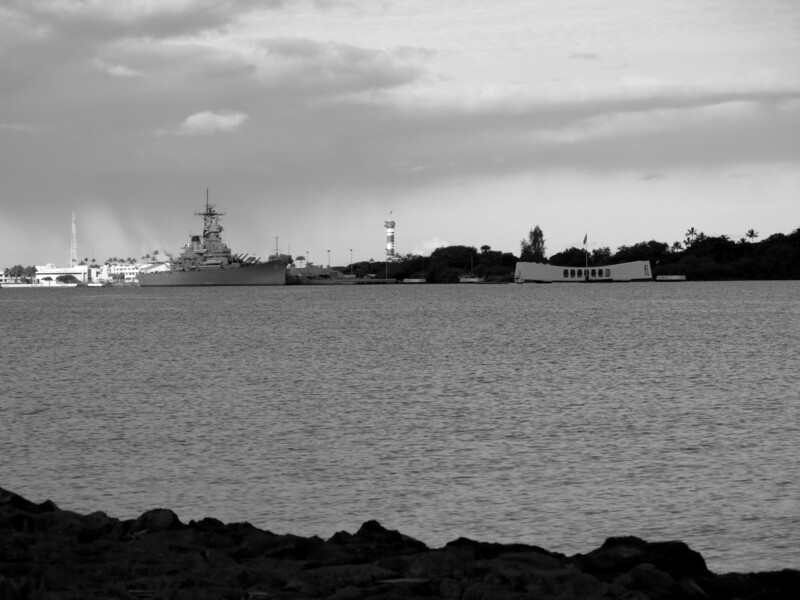 I have a passion for history and visiting Pearl Harbor proved to be a wonderful, insightful experience. I want to understand history from the point of view of the people who lived it, particularly WWII history because it shaped the world as we know it today. History was made at Pearl Harbor and we are still dealing with the repercussions in many ways today and visiting it in person, no matter how much you’ve read about the events of December 7,1941, will undoubtedly affect you and teach you more than you could ever learn from reading or watching movies. That being said, I feel like visiting Pearl Harbor has provided me with new insights to carry to my other passion: game development. I personally believe that done well, games offer us a window into things that we don’t understand that is unlike any other media in existence. Games are interactive and experiential and I think that narrative focused games could do a lot to help us understand our history while still proving entertaining. I’m in the camp that thinks WWII games should make a comeback using the best technology we have available. I don’t believe that the “great” WWII game has been made yet. There is no Saving Private Ryan or Band of Brothers of World War II video games yet. Some have captured moments of the conflict – the D-Day sequence in Medal of Honor: Allied Assault, the Pearl Harbor scene in Medal of Honor: Rising Sun and countless other moments of WWII have been portrayed and often done well in games like Call of Duty and Brothers in Arms, but what these games often fail to capture are the extremely human parts of World War II – the parts contained and focused on heavily in most of the memoirs I’ve ever read. Combat was absolutely a huge part of WWII and should be a focus of (almost) any game set in the conflict, but most of these games fail to take on or involve (cut-scenes don’t count) the player in the tragedy, heart-break, triumph, humor and brotherhood/unity that were part of the carnage. This isn’t a slight to the developers of the titles I mentioned above – I understand budget and technology constraints, but with games like The Last of Us or the poorly titled, but woefully underrated Spec Ops: The Line coming out now, I think we’ve learned a lot over the past decade and that we should take into account. In short, the first “great” WWII game of Saving Private Ryan caliber will be exhaustively researched and all respect will be given to the veterans and politics of the time in order to give the player the most comprehensive experience that you possibly can. (And hey – if you’re hiring to make a World War II game, I’m definitely available *wink*). The tour we took was the Pearl Harbor & Historic Honolulu City Tour, but there are plenty of options. So many things of beauty in Hawaii! There are so many gorgeous landscapes in Hawaii. We thought we’d share some of our favorite photos from the three islands we visited: Oahu, Kauai, and Maui. Beautiful beach we found on a bike ride. 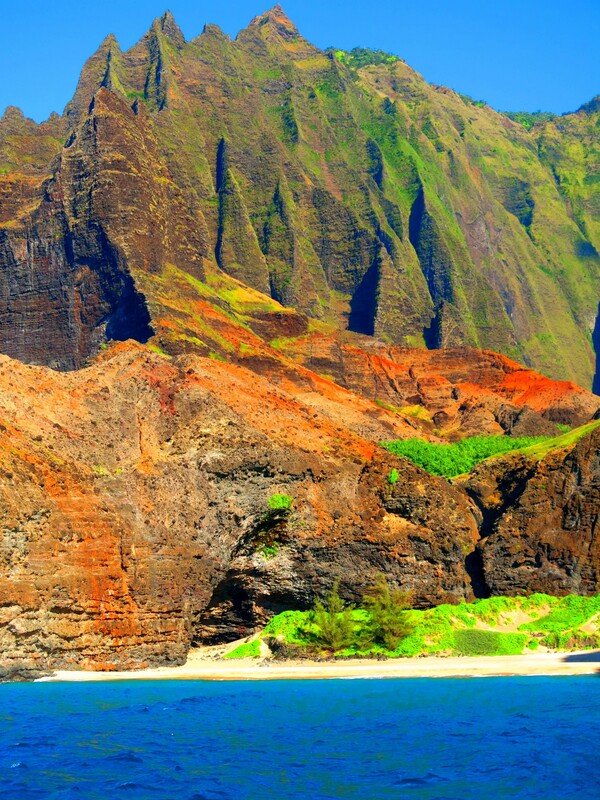 Anyone who has researched the Hawaiian island of Kauai has most definitely encountered stunning scenes of the Na Pali Coast. It’s pretty impossible to avoid them. Pinterest is filled with them, and I see it pop up in my Facebook feed nearly every day. It has this mystical, other-worldly beauty that has long captivated all who are lucky enough to witness it. 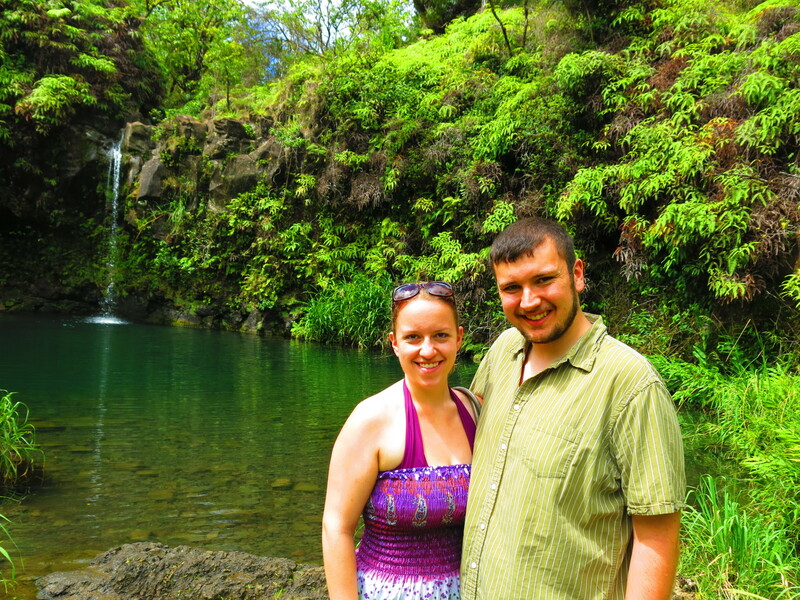 Kyle and I were two such lucky people last August when we visited Kauai as part of our three-island anniversary trip. Now, there are lots of ways to experience the Na Pali Coast, but the traditional way people see it are about the least traditional ways you can imagine. Only about 10 percent of Kauai is accessible by car, leaving the rest to be explored by foot, air, or sea. If we’d had more time—and any ambition to hike 11 miles—we could have followed the Kalalau Trail along the Napali Coast. But since we’re less than athletic, we opted for viewing the coastline via helicopter, catamaran, and canyon rim! The dramatic coastline first came into view as we rounded the island on the hour-long “Private Island” tour with Mauna Loa Helicopters. We chose the company because they allowed for a “doors-off” tour. I captured unadulterated views of the magical Na Pali with my camera. It has this way of leaving you totally speechless—and after the tour, you wonder if it was all just part of some fantastic dream. That same evening, we boarded the Southern Star Na Pali Dinner Sunset Sail with Capt. Andy’s Sailing. The four-hour cruise began with cocktails and longing on the front of the catamaran, feeling the sea spray on our faces. We saw a pod of dolphins playing in the waves, and watched flying fish jump in front of our boat. Then we saw it—those spectacular cliffs from an entirely new angle. 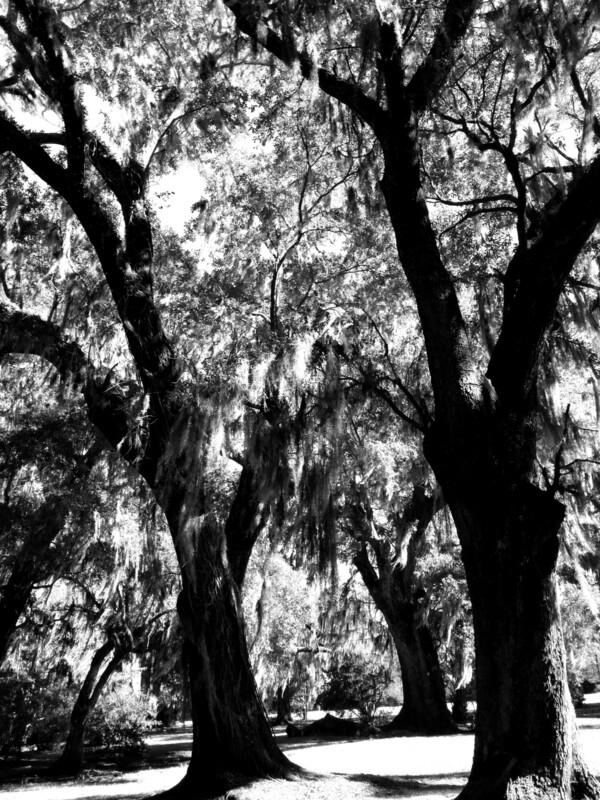 They almost take on this foreboding appearance when you’re gazing up at them instead of looking down from a helicopter. It’s one of a handful of times in my life when I’ve gazed upon something so gargantuan and felt inconceivably small. After the requisite number of pictures are taken in front of the cliffs, a delicious meal is served on the return trip—along with gorgeous sunset views. The following day, we got a third viewing of Na Pali by a very happy accident. We decided to venture up the Waimea Canyon. We’d see this by helicopter the previous day, too, and wanted a closer look. The reds of the earth are like nothing we’d ever seen! At the very top, we pulled off at the Kalalau Lookout. Now, if I’d done my research, I would have known about the dramatic views, but not knowing was almost better! Standing 4,000 feet above sea level, the lookout gives you a dead-on view of the Na Pali Coast—one perspective we hadn’t yet seen. Some of my very favorite pictures from our Hawaii trip came from this very spot. I highly recommend a visit! No matter how you choose to view the Na Pali Coast—by air, sea, hike, etc.—just make sure you take in the views on your trip to Kauai. 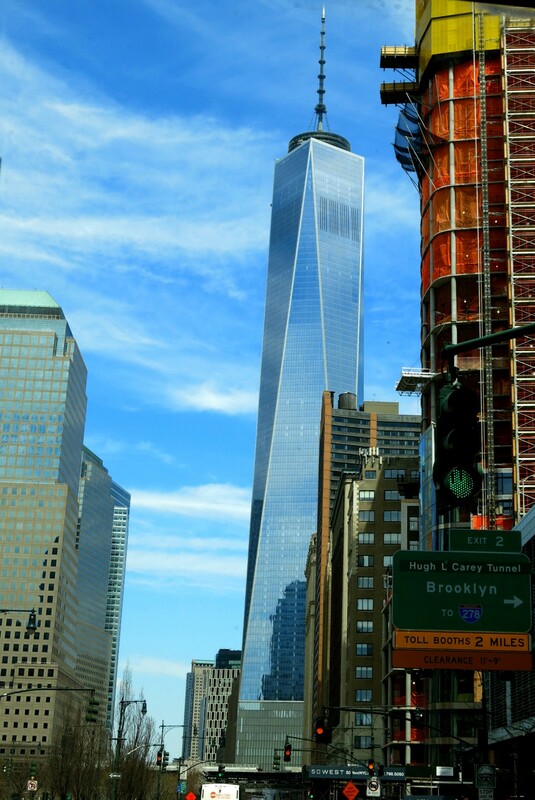 It is truly a sight to behold, and will stay with you long after you leave. Trust me.